Ultra Violet is the Pantone color 2018 and thus the absolute trend color for this year. 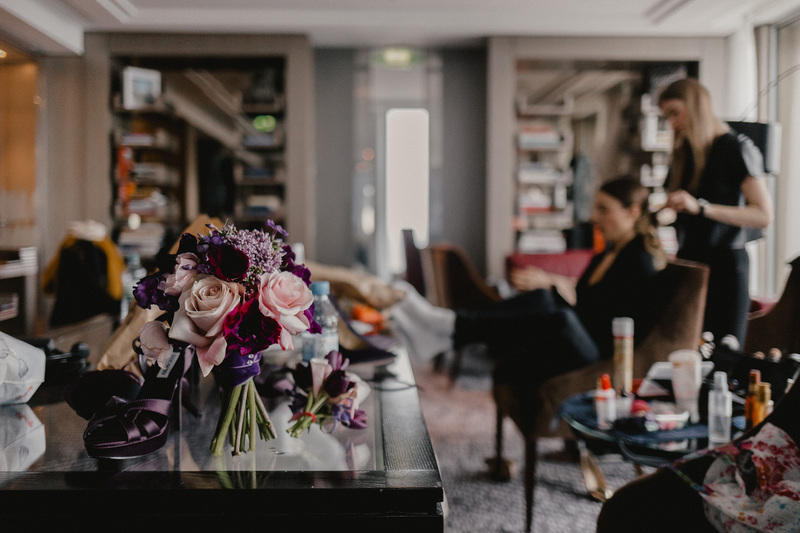 To give you an idea for the look and feel of an Ultra Violet wedding setting, Ellen Kapalka from wedding blogger Frieda Therés together with wedding planner Lena Hergesell organized a styled wedding shoot right at the beginning of the year. Above the rooftops of Berlin – at the Waldorf Astoria Hotel – an exclusive backdrop was created in which the ensemble of stylish table decoration, patisserie and wedding fashion was charmingly set in scene. 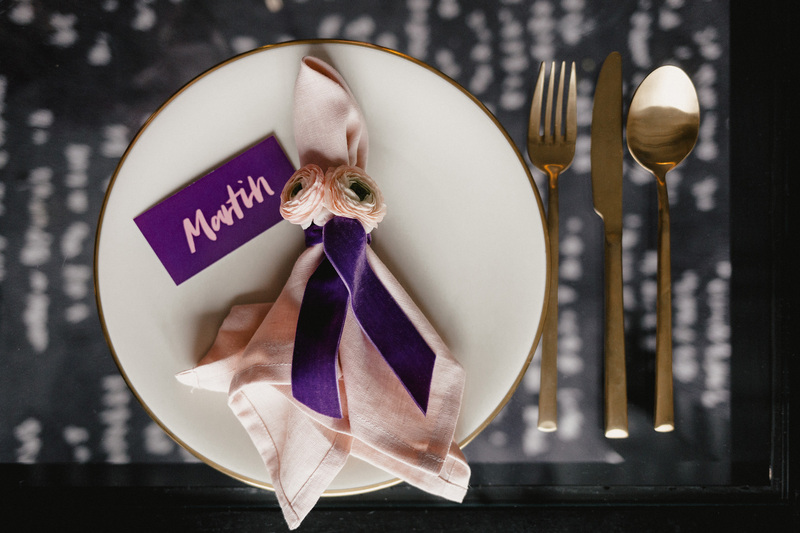 We were there and reveal why the dramatic purple is an absolute must have for any wedding. If you are looking for exclusive wedding inspirations, first-class bridal wear, exquisite patisserie and stylish wedding decorations, then Frieda Therés is the perfect choice. Behind the fashionable wedding blogazine is a passionate blogger from Berlin, who gives her readers daily exclusive inspirations from the wedding and beauty area. Her ideas for flowers, pies, weddings, decorations and Co. are stylistically based on the latest national and international trends. In addition to Pinterest and Instagram, her blog – which, by the way, is named after her beloved grandmother – is one of the most popular sources of wedding inspiration, making her the number one point of reference for brides and wedding voters. In order to give her readers an impression of the Ultra Violet trend, she made it live in our wedding shoot. Since we are big fans of colorful settings and have a special passion for the fashion color Ultra Violet, we could hardly wait to create a suitable decoration setup for the shoot. In keeping with the theme we created an Ultra Violet bridal bouquet and complemented by a few smaller flower combinations in pink and purple tones. In addition, we chose modern candlesticks in gold and violet candles for the table decoration, which reflected the look of the flowers. The whole thing was placed on small, transparent tables with a casual, black border. This resulted in an ultra glamorous setting – to match the demands of lifestyle oriented urban nomads. Stephanie von Cakes Berlin was also present at the Ultra Violet wedding shoot. In the heart of Berlin-Krezuberg she creates daily individually designed wedding cakes. These are not only delicious, but also look stunning. Especially welcome are those who are in the mood for something unconventional and who dare to order a wedding cake that looks like none at first glance. Although they make each cake individually, they all have something in common: they are filled with fresh cream and cream cheese, covered with a butter cream and chocolate drops and decorated with loving details and flowers. The flavors range from chocolate vanilla with Oreo cream, over salted caramel, to lemon berry. As well as the cake style and the color accent you can also determine the taste individually. 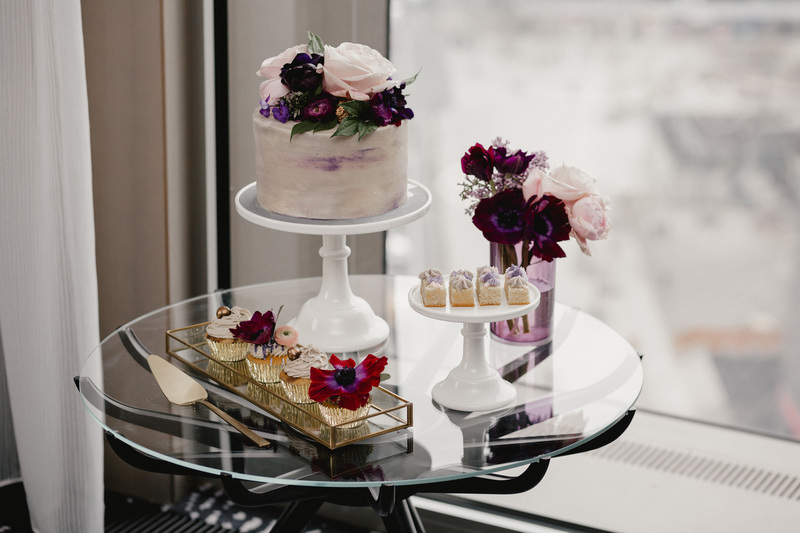 For example, Stephanie chose a light cheesecake for our shoot, mixed in a few pureed blueberries and decorated it with our flowers according to the theme. The result fit perfectly into the glamorous backdrop of the Waldorf Astoria library and knocked us all off – especially as we ended up tasting it. In keeping with our table decoration, the vintage harness rental gotvintage provided golden cutlery for the photo shoot and gave the entire setting a luxurious touch. Always on the lookout for new treasures, the company offers carefully crafted vintage inventory and makes the hearts of retro lovers beat faster. So if you want to organize your wedding in a vintage style, you will definitely find the right equipment here. In addition to cutlery in matt gold, matte black and floral patterns, the range also includes vintage dishes, furniture and decorations. In addition, you can of course also request an individual package. What would a wedding shoot be without a bride? Fortunately, we had Paula Romy on board, who is otherwise traveling as a model, actress and choreographer in Berlin and London. While she was styled by our make-up artist Ekaterina Igonina in preparation, we dedicated ourselves to the dazzling wedding dress by Kaviar Gauche. The designers Alexandra Fischer-Roehler and Johanna Kühl specialize in modern bridal wear and create exclusive dresses for brides who have high standards of design, material and fit. Flowing fabrics, filigree lace and that certain detail characterize the label. For our wedding shoot they presented us the romantic “Bloomy Rose Dress” with a floral design. The sophisticated interplay of transparency and hand-applied flowers made our bride a real eye-catcher and formed a silhouette that was skillfully complemented by endlessly delicate flowers. The awesome images from our Ultra Violet shoot were created by wedding photographers Mister and Misses Do, who jet through world history almost all year round, creating great photographs of storybook weddings. Maybe soon from yours? So far, what did you like best about our Ultra Violet wedding shoot? Would you like to use the trend color as a color accent for your wedding? We would be happy to receive your comments!